I'm happy to report that the last of my Christmas cards (except a few of Dan's friends who have moved in the last year -- I'm off the hook, though -- that's his job to track down their addresses) are going out in today's mail! This is the latest I've ever mailed out cards, but I'm happy that they will at least be postmarked before Christmas! I thought I was being smart this year when I ordered photo cards, but I had a handful of friends and family that will receive both a handKrafted card and a photo card. When it was all said and done, those ended up weighing a little over an ounce. It was Dan to the rescue again, making a last minute trip to the PO for me. I'm getting ready to work on some projects that I won't be able to show you for another couple of weeks. In the meantime, I'll try to post a few new things to keep it interesting for you! 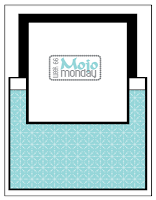 Here's a simple one using Julee's Mojo Monday week #66 sketch. 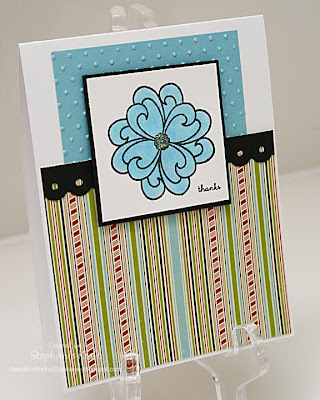 Cardstock: PTI, CTMH; Patterned paper: October Afternoon; Stamps: Verve, PTI (sentiment); Ink: Memento Tuxedo Black; Copic markers; Shimmerz Angel Wings; Cuttlebug swiss dots embossing folder; Fiskar's Threading Water punch; Other: Star Dust stickles, foam tape. This is very cute Stephanie!! I always love simple elegance and you've done that perfectly here! !